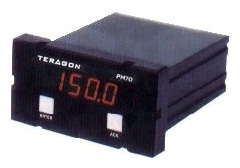 Teragon's PM70 is a high precision, industrial-grade, digital panel meter. It accepts all the standard process signals: 4-20 mA, 0-5 VDC and 0-10 VDC. The 4-1/2 digit display can be scaled to any desired engineering units. The display includes an extra zero which may be used to show numbers up to ±199990. The PM70 comes equipped with a 24VDC power supply that can be used to power current-loop transmitters or 3 and 4 wire transducers. Optional relays permit the PM70 to function as an alarm or as a controller. The SPDT relays are rated for 2 Amps at 240 VAC and can be programmed for automatic or automatic plus manual reset. The relays can also be programmed for 0-100% deadband. The PM70 is designed to be a robust, user-friendly, high-precision panel meter with the features most commonly required for process monitoring and control. Inputs: Field selectable: 4-20 mA, 0-5 V, 0-10 V.
1/14 HP @ 125 / 250 VAC for inductive loads. Prices are FOB San Francisco and are subject to change.